There are very few things that I dislike about living in Germany. However, one of the biggest inconvieniences is to fly back home to the States. It isn’t because I’m dreading going home. It’s quite the opposite; with travel hacking, that means I can travel for close to free making it much more accessible to go home on a regular basis. In fact, because of travel hacking, I average going back State-side about two times a year. 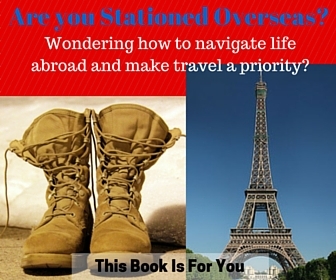 Many people stationed abroad go home MAYBE two times their entire time overseas due to money. No, it is the actual long haul flights themselves that I never look forward to. Having to spend 8-12 hours cramped into a tiny seat stuck next to a person who either smells or is taking up too much of MY space is never a pleasant use of time. Not to mention the fact that I have a horrible time sleeping on planes, so on the flights when the time frame is my night, I can basically count on being a tired mess at my destination. So, how do I survive long haul flights? Well, after countless Trans-Atlantic as well as a handful of long, Asiatic flights, I’ve come to develop a system to help me enjoy and be as comfortable as possible on any length of flight. Let’s start with before you ever even arrive to the airport. You need to have packed the essential gear to get you through a long flight as well as having packed it efficiently. When you are traveling, it is always good to keep a few key amenities on hand, especially if you check your baggage. Even though I almost only do carry-ons, I still have a specific bag that I keep by my feet that has all of my essentials. Especially if you are a middle-seat, don’t be that person that needs to get up constantly to get something out of your bag. Yes, having a tiny bag under the seat limits your space, but barely. That’s why I love my small Osprey Daylite Backpack , which de-attaches from my main backpack (also a carry on), to store all my goodies that I will need during my flight. – Amenities: In a small bag (makeup bags work great), bring a mini toothbrush, mini mouthwash, lotion, chap stick and face wash or wipes. Settling in for the night after running through your usual bed time routine could help you sleep. There is also nothing as refreshing as brushing your teeth after sleeping open mouthed from having to be in a sitting position for hours! – Entertainment: In your floor bag, stash whatever you are going to use for entertainment. For me, this means my tablet which is just one device that stores tv shows, music, books and apps for the trip and more. For you, this may be a book, MP3 player and headphones, small laptop, Ipad, kindle or any other tech gear you may have to help you stear clear of boredom on your flight. Tip: Double check that everything is charged and ready to go the night before the flight. Some planes now have USB plugs, which are especially helpful to stay charged. However, those don’t always work and when they do, if you are watching a show or something that takes up juice, you’ll still be watching your battery bar quickly go down. Double Tip: One of our best travel “investments” was a portable charger. This way, if you forgot to charge, it’s no big deal. Once again, we aren’t even on the plane yet, but we need to think ahead so that we can be comfortable for the flight. -Comfort: You need to pick clothes that are comfortable. I am not the one to ask for fashion advice and am the gal that (sometimes to the horror of anyone fashionable) will choose comfort over style. For me, this often means leggings and a loose shirt. If we’ve travel hacked our way into Business Class, then I will wear a comfortable dress over leggings. Another great tip is to wear a maxi dress or skirt. You’ll still look good and yet still be relaxed. This way, I’m entirely comfortable but don’t look like a cheap backpacker. Layering: Planes can be awful finicky when it comes to temperatures. I’ve been on flights were it was easily 85-90 degrees the entire time and others where I wished I had my winter coat! The problem is that you never know what range you’ll get. So, it’s all about layering. I often will pair my leggings with a loose shirt and a tank underneath. Then, I’ll bring a fleece pull over. Even in the summers, I still like to have a long scarf so that I can double it as a blanket if need be. I have been caught on a plane in the summer with no socks and it was no fun! If you are wearing sandals, throw a small pair of socks into your floor bag so your toes can stay warm. The key is to wear clothing and layers that you can take on and off easily to help you easily react to any temperature the plane throws your way! It is amazing how eating clean and staying hydrated before a long-haul flight can greatly help with jet-lag as well as help you have a more comfortable flight. A few days before your long flight, start drinking extra water. 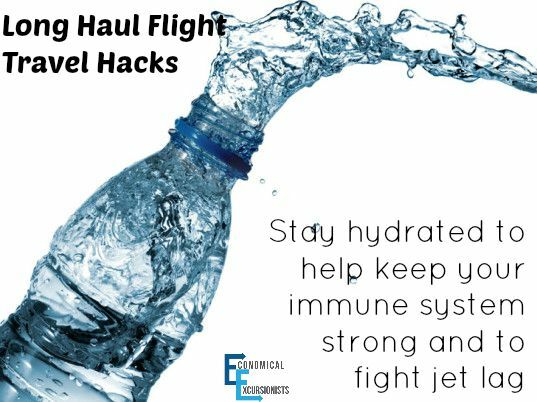 It is incredibly easy to get dehydrated while flying, so starting early will help to combat this. If you can swing eating healthy starting a few days prior, you’ll feel so much better for it, too. We all know that we can’t go through security with full bottles, so bring a bottle of H20 with you and chug it shortly before the security checkpoints but keep your bottle in your carry on. As soon as you are on the other side, don’t even think about paying the hefty, overpriced vendor costs. Just fill up at a water fountain and continue on. Staying hydrated is known to help keep your immune system running well, even with that circulated air, can help with jet lag and overall will just keep your body more adaptable. Note: Galley water from a plane is known to not be the cleanest. Fill up before boarding and ask for bottled water for the duration of your flight. As silly as it sounds, timing your bathroom breaks can help make a flight go easier and with all that water you’ve been drinking, surely you’ll need to find a pit-stop. Granted, you are talking to the world’s smalled bladder here, but when they start calling for Business and 1st Class passengers, you still have a good 10 minutes before they start announcing for economy passengers. I take this time to run for one last bathroom break before boarding. Nothing is so uncomfortable as willing the seatbelt sign off shortly after take-off because your bladder is about to burst. Tip: Bring flip flops in your floor bag. That way, you can kick off your shoes and be comfy during your flight, but then just slip on some sandals quickly to use the restroom on the plane. When booking your flight, try your best to pick your seat. Aisle: While people complain about the carts going up and down the aisles, I find that these seats are often my preferred seat. 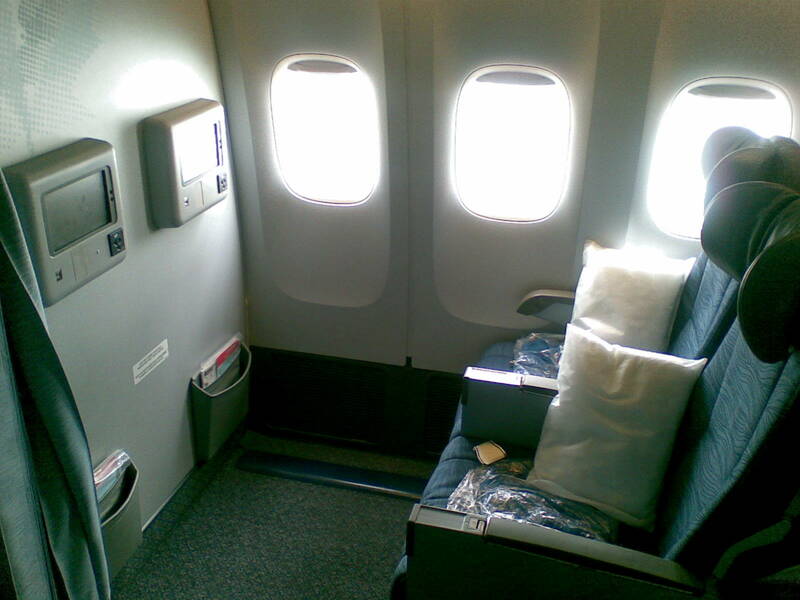 I can stretch my legs just a few inches more into the aisle (as long as your legs are relatively tucked into the chair in front of you, passengers can still easily get by) and I don’t have to bother anyone by asking them to get up to use the restroom. Window: The window seat is good for those that can hold their bladder. They can get great views and an extra place to lay their head when trying to sleep. Emergency Exits: If you are physically capable of helping in the event of an emergency, many emergency exit seats have extra space so that people can easily get to the door. This means more leg room for you! Bulk Head Seats: These are the rows that don’t have seats in front of them, but instead the wall that is usually to the galley or bathrooms. These spots always have extra leg room. If you have a baby, ask for these seats and they will even provide you with a baby bassinet. Finally! We are passed the planning and packing stages and have finally made it into the airport. It may sound silly that all of that preparation was not even on the plane, but taking those precautions will greatly help make your long-haul flight so much more enjoyable! We’ve already shortly touched on the food topic, but don’t stop once you get to the airport. In fact, skip the double-priced double whoppers and bring your own food! The easy things to pack are fruits, jerky, granola , quest or lara bars, and nuts (Note: while you can take these things ONTO the flight, they often need to be consumed before landing for customs purposes). People ask all the time what is and isn’t allowed and you’d be shocked to know what I have brought onto a plane for food (full salads + the 3oz of dressing, yogurt, protein powder for shakes, meatballs and marinara, boiled eggs and cauliflower pizza (my neighbors did not appreciate those last two!). Basically, most foods are allowed. If it is a liquid, you are limited to the same 3oz rules as any other liquids carried on. Why do I go through the hassle of packing my own meals? 1) I don’t always care for the crummy airplane food they are serving 2) I ATTEMPT to eat as healthy as possible, even when on trips and the tiny pre-packaged meals they have often aren’t all that nutritious. 3) I have found that the better I eat, the less lethargic I am, the better I can sleep on the plane and the less jet-lag I have. Many people will ask for the vegetarian meal. They say that it is often lighter, meaning easier to digest and therefore won’t make you feel as weighted down and can avoid that general “bleh” feeling that many pre-packaged airplane foods can give you. However, I find that many vegetarian meals on planes are pastas, which make me feel the opposite of light and airy. The point is to simply know that your food choices may help to make a more comfortable flight, so choose accordingly to what fits your needs. We’ve already talked about water, but let’s talk about booze! On many long-haul flights beer and wine and often even an after dinner appertive is now included. While I always enjoy me a glass of red wine, I’ve found that on planes, it is often better to skip the booze, or just enjoy ONE glass during dinner. While a few drinks before they turn out the lights may help you initially fall asleep, research has shown that alcohol can interrupt your sleep more and keep waking you up throughout the night. Plus, the more you drink, the more dehydrated you become…sooo, see point #3 again! Getting some shut eye is often the part that people struggle with the most on long-haul flights! I have found that while I am never going to get a full night’s sleep on a plane, there are a few things to help me feel more comfortable and hopefully get a few more zzzs than if I hadn’t done them. Tea: After dinner, have a warm cup of tea and start to decompress. Turn on some relaxing music on your headphones, read a book and start to give your body signals that you are winding down. Try to avoid caffeine a few hours before the time you want to try to sleep. You can either use the tea they have on board (often a black tea) or just bring your own bag or two of your favorite, relaxing blend. Eye mask and Earplugs: I don’t go ANYWHERE without an eye mask and earplugs! You can get both of these for incredibly cheap at most drug stores or just get a travel kit . This is not only a good signal to those around you, but they will also help you block out the sites and sounds of all the distractions that may keep you awake otherwise. Once again, stash these in your floor bag for quick and easy access. 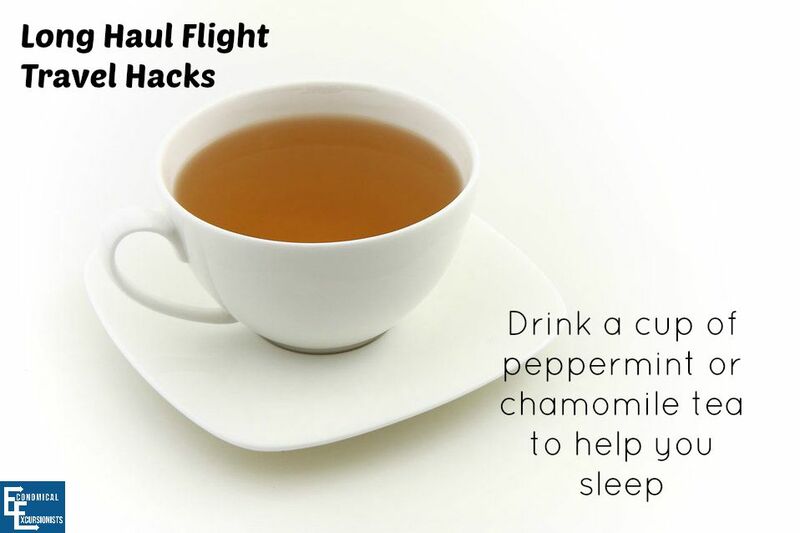 Sleep Aid: Some people like to use an over the counter sleep aid when flying. I usually try to avoid this route if at all possible. However, if you choose to do this, some safe, over the counter options are: melatonin, unisom and Zquil are a few that are generally known to be safe in small and infrequent dosages. (Note: Always check with your physician before taking any medications). Timing: Time your sleep with your destination: If at all possible, try to coordinate a good chunk of your sleep time with your destination’s time zone. This isn’t always possible, but if you can, you not only will still get a little sleep but will already be on your way to adjusting and reducing jet-lag! Bring a Neck Pillow: There are hundreds of styles of neck pillows out there and while yes, you are provided with a small one on the plane I 1) Don’t know the last time it was actually cleaned 2) I normally need more than just that. So, I often use the provided pillow as lower back support or double it up with my own. My husband swears by his NeckBone Pillow , while I enjoy the U-Shaped ones that are more bendable. Most of travel is based on going into experiences having realistic expectations. If you board the flight thinking you are going to get a decent nights sleep and will be ready to bounce off the plane ready to hit your destination full force, you will probably be sadly disappointed. However, if you go into it knowing that the next several hours may be slightly uncomfortable and that you are probably going to need a giant cup of Joe and a quick nap upon landing, you are probably going to have a better experience! There are plenty of ways to try to make the most of a long-haul flight. Chances are, unless you have been upgraded, they are never going to be the most pleasant thing in your life, but they surely won’t be the worst. 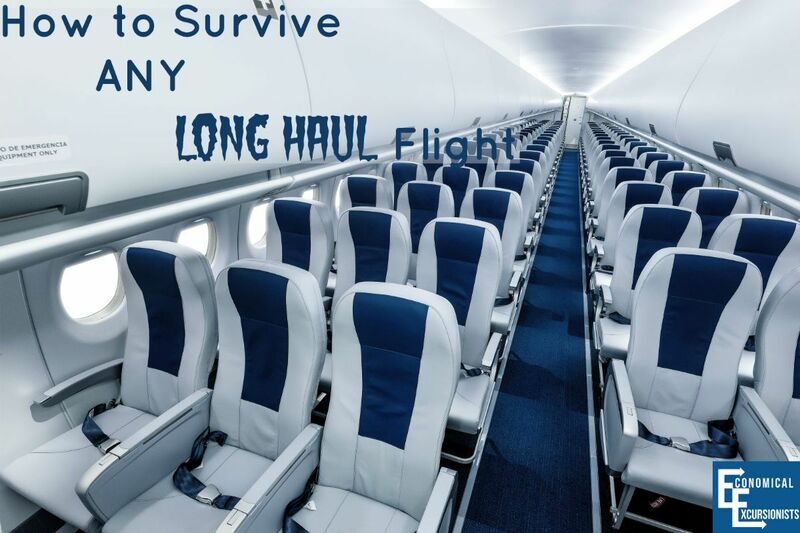 As long as you prepare accordingly and are conscious about a few choices to make, you can reduce some of the uncomfortablenesses of flying for long periods of time in economy. What have you done on a long haul flight that has made your time and experience more bearable? Let us know in the comments below. Need a great carry on backpack for your next flight? Here’s our Packing Light Tips. Or if you are more of a luggage kinda traveler, here are some great wheeled backpack options! I’d love to find out how to hack my way into business class for flights to and from europe! I’ve found that my key is not overpacking my carry on so that I can get to things without having to practically unpack! I agree that packing is key! Unfortunately, we almost exclusively fly with carry on only, meaning our bags our packed to the brim, especially depending on length of trip. It would just be cruel and unusual punishment to the other passengers to deal with me searching through that! Hence, the floor bag! Some great ideas! I like to sit nearer to the restrooms to spot when there’s a good time to go. Also, when I take Dramamine or Meclizine that makes me sleepier so I can get some rest. Getting up to walk around, stretch, and move during the long flights also helps with swollen ankles. Thanks for the tips! I agree! Not sitting for the 10+ hours is also key! Even just getting up to walk the aisle a few times can greatly help! great post! a noise cancelling headphone is also helpful for sleeping on flight, mine is Bose QC25. I read your interview from Million Mile Secrets newsletter, love your story! We share the same frugal living style, no TV, internet only at home, sharing one car and eating healthy by doing home cooking. I even have the same Osprey travel backpack as yours. I just started this miles & points thing by signing up IHG, chase sapphire cards this summer and already saved a bunch on hotel stays and I’m working on saving enough for a free flight trip. FlyMiler seems to be a very helpful tool for this purpose. I wish I knew resource like this earlier because we traveled a lot and never saved enough miles for free tickets before they get expired. Oh man, this would’ve been good a week ago! Just did the flight back home to the States from Vietnam! 36 hours of travel= BRUTAL!! Definitely agree with the hydration, eye-mark, and ear plugs. Haven’t done a sleeping pill quite yet; they usually have an adverse effect on me after I wake up, so I just expect the worse and hope for the best! All said and done, the long haul is so worth it in the end! Happy to be home with family for the holidays! Yes, coming back from Asia can be brutal! It takes us about 24 total travel time just from Europe. I avoid the meds at all costs, too but some people swear by them! I FULLY agree with you about the food. It’s become routine for us to pre-prepare long haul flight meals, healthy snacks etc. The food online can be average to terrible and so processed carb/sugar heavy – and for us, never enough. Skipping the over priced crap you risk buying at the airport before hand also a very good idea! Exactly! Besides, if the worst that can happen is I get a few nasty glares from those around me as I eat my stinky boiled eggs, then oh well!! These are some pretty detailed suggestions – I love it! I agree with you, the portable charger I have was the best investment ever, I can only recommend that for every traveler. However, I always forget to bring earplugs and I always regret it. Hope to remember them the next time! I actually just keep a set in my bag at all times (never unpack them) because if I don’t I’m sure I’ll forget, too! I like wearing a maxi dress so if I’m bumped to first class I’m all set. I don’t go ANYWHERE without an eye mask, neck pillow and earplugs too. All wonderful suggestions. My favorite is having realistic expectations – that has made traveling on long haul flights much better for me. I expect it to be uncomfortable, and sometimes, I’m pleasantly surprised. Haha yes, sometimes low expectations can then make things all the better when things go well!!! Wow. What a comprehensive guide. The flip flops tip is a good one. I’m an aisle person myself! A neck pillow is my number one ‘must have’ for a long haul flight. As much as I must amuse fellow passengers with my open mouth, flying catching, big nod routine without one, I sleep far better with one!! Really great tips–thanks for sharing! Long haul flights can be so frustrating, so any little things that can help make such a difference. I especially love the tip about layering–we were just on a couple of flights last week and one was extremely hot while the other was freezing! You never know what you are going to get! Such an awesome and comprehensive list of suggestions to make a long flight more bearable! The older I get the harder it seems to bounce excitedly off the plane when we arrive. Finally realizing that jet lag is real! Hydration and comfy layers are key for any flight. I also love the idea of mimicking your normal bedtime routine and having a cup of tea to wind down. ← How To Travel With Friends…and STILL be friends after!